Well, it was a toss-up this year for my Labor Day destination. I thought about staying close to my hometown of Nashville and visit Knoxville’s Boomsday festival, but that would mean leaving Scamp and Rambler behind again . So, I’m packing them up in Max, the Airstream, for one final summer outing. I decided to head due south to Kingsland, Georgia for the 30th Annual Labor Day Weekend Catfish Festival. 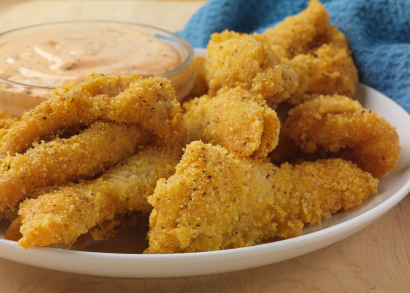 What Tennessee girl doesn’t like catfish? The festival started as a one-day small town festival, but now it’s grown to a regional event featuring arts and crafts, a big parade, and tons of southern food! Scamp and Rambler will probably beg me for a bite, but they’ll have to stick to their diets even if I’m not sticking to mine. After my previous visit to the Georgia coast in January, I knew I had to get back to close out the summer. Sharon and Phil (who I met on my last trip to the Peach State) are set to meet us there. What’s great about Kingsland (other than all the catfish you could possibly want to eat in a weekend) is that it’s close to the beach and better for my travelling companions since it is also close to wildlife areas and state forests. My worry with the dogs running in the wooded areas this time of year is all the ticks and fleas (yuck!). My vet friend Bailey told me most dogs can get them from weeds and high grass, so I thought about getting a flea collar for the guys. She told me some over-the-counter products can work great too, so I think I’m going to give them a try. We’ll see how it goes! Love my new LED lights! I have a feeling Sharon and Phil will be jealous of Max’s “upgrade.” The new addition is very much 21st century. Dometic has some really cool LED lights that help me “light up the night” so I can enjoy the cooler autumn evenings that are on the way. 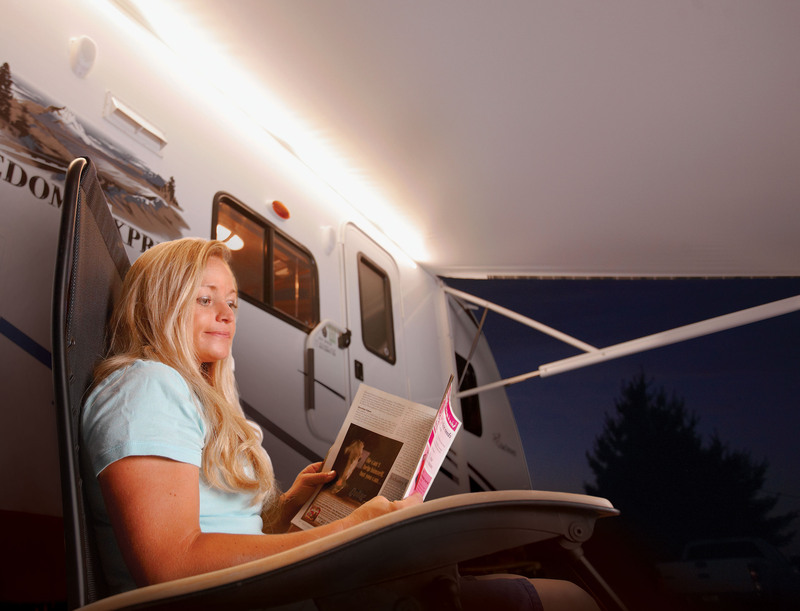 They hook right onto my RV’s awning so I can sit outside and read, eat, and play with Scamp and Rambler well after the sun has set. I really didn’t know a lot about LED lights, so I did a little research. I learned that LEDs are much more energy efficient than typical “bulbs” and can last thousands of hours longer than regular lights. Sounds good to me! I’m really looking forward to visiting southern Georgia again and seeing my newfound friends (and now e-mail buddies) Sharon and Phil. It’s amazing how the adventure of RVing can open up a whole new world to us and open up the opportunities to meet people we may have never met if we hadn’t chosen the RV lifestyle. For Scamp and Rambler, they’ll be happy to revisit the sandy beaches and pine-laden state forests in the area…and to fruitlessly search for some festival fare.